After a most beautiful June (okay, the last part of the month anyway!) we now find ourselves in July, which for us, means vacation time! This year we are actually doing two trips: next week, a five-day/four-night trip to New Hampshire which will include climbing Mount Washington. Weather permitting, of course. It if is as hot as the last week of July, I am NOT going to climb! No way, José! That said, we’ll see once there. The second trip will be a return to Cape May, New Jersey. We so enjoy going there with my sister and her family and whichever friends also choose to join us. What does all this mean? Time to READ! Without guilt! Without worrying that the house needs to be cleaned! I will be able to finally finish June’s choice, “As Always, Julia”. Though I am enjoying this book, I must take breaks. Most of the letters between Julia Child and Avis DeVoto are fun to read. Those ladies wrote (typed) some really long letters! The reason I need to take breaks is because both of the ladies were very political. This book covers the letters between 1952 to 1961 which is also the during the time Julia was creating “Mastering the Art of French Cooking”. (It was a loooooong process!) I’m not American so when it comes to the political scene during the McCarthy era, they kinda lose me! That said, I’ve a good 100 or so pages to go and then I will start my July selections! I dream of going to Tuscany one day (and regularly threaten my family that once I go, I’ll not come back!) and I loved the original book Under the Tuscan Sun by Frances Mayes and, though they changed some of the story line, I loved the movie too! When I saw this book, I just grabbed it with the intention of reading it when I felt like pretending I lived there…. That time has come. I’m counting on Every Day in Tuscany to be just as wonderful as the first and just as loaded in fantastic recipes. Talk about combining two of my loves: cooking and reading! I chose a second book this time because we will be on vacation and I end up reading LOTS. I am a big fan of Jodi Picoult, though I don’t like to read two of her books in a row – usually too heartbreaking and oft times her endings are not overly happy. Change of Heart has been on my shelf for a good while (borrowed from my sister as I do for all of Picoult’s books!) because I was waiting for a time to be in the mood for her style. The way she presents more than one side to a story is amasing. She is a pro at it. Must spend hours and hours researching and she remains quite objective throughout. Looking forward to sinking into a comfy chair with a nice glass of wine or a Caesar or a beer! 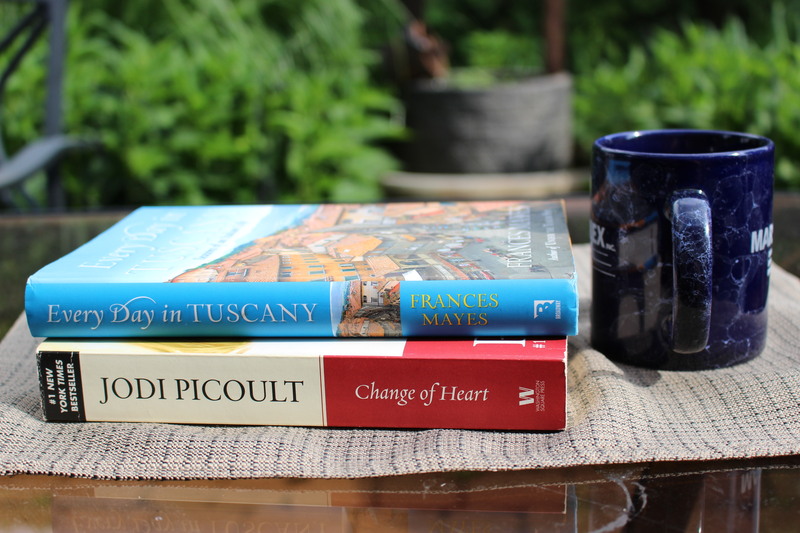 This entry was posted in Books, Challenge and tagged Change of Heart, Every Day in Tuscany, Frances Mayes, Jodi Picoult, summer holidays, the year in books. Bookmark the permalink. Have you ever read “The Education of Little Tree”? I listened to a very interesting commentary on the actual author (hint: author is fictional) on NPR the other day. Now I really want to read the book. What a coup! I hope you have a great trip. I am currently reading Into Thin Air by Krakauer, and I don’t recommend that before a climb. May your weather be pleasant and without humidity. Happy climbing! Are you enjoying said book? Should I put on my “to-read-list”? Thank you, kind lady, will keep ya’all posted! Yes, Dale! CJ and I are both loving Into Thin Air. We’ve been discussing it at the coffee shop and have had two people come up to us and tell us, “I loved that book!” It’s some of the best, maybe the best, narrative nonfiction I’ve read. Then I am totally adding it to my “to-read-list”! Hmmm… going to be in New Hampshire this week (climbing Mount Washington is one of our objectives), maybe I’ll find a copy there… it’s a tad cheaper in the US for books… Why? I cannot say… so frustrating! Oh Tuscany calls me too, big time! At least you are a tad closer than I! Now that sounds like an excellent plan! Extremely happy you think so!